The House of Tea is an exclusive outlet of Goodricke and located on Nehru Road that leads to the Chowrasta Mall. Here you can taste and buy some of the best brands of Goodricke tea that come from their Darjeeling tea estates. Goodricke is now the largest producer of tea in the world. The owner of the outlet Vijay Puri told me that Goodricke has 27 gardens in the Darjeeling area itself. There is a map in the shop that shows locations of the gardens. The company also has gardens in Kenya, Nepal, Bangladesh etc. As you walk into the tea bar a few steps above the road level and through the large glass door, you will see a counter on the left followed by a nice small lounge area. 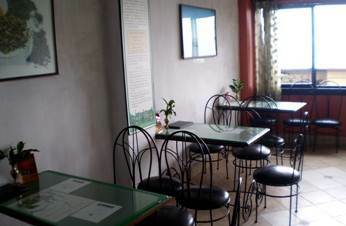 This tea lounge and cafe is relatively new and now over 6 years old. There are wrought iron cushioned chairs and glass topped tables that are laid out in rows. At the end of the lounge there are large glass windows that open out to great views of the valley and the mountain range. On the wall hang several framed paintings. However the most interesting is a framed certificate hung up on the wall. It shows that Castleton Tea from the Goodricke garden created the world record when it was sold at the highest rate of Rs. 13,001/- per kg in the public tea auction in Calcutta in 1992. However the tea prices have gone up a lot since then. The owner Vijay Puri mentioned that the world record in Sept 2011 was Rs. 1,35,000/- a kg for a Chinese Green Tea. You can taste various kinds of freshly brewed Goodricke's Darjeeling tea at this outlet and then buy packaged tea if you like. If you plan to drink tea here at the lounge, you can have it served by cup or small pot for two, or by a large pot. Some of the great teas that you can taste here includes Margaret's Hope Spring and Summer Teas, Castleton Muscatel's Second Flush, Castleton Clonal Light & Fragrant, Thurbo First Flush, Thurbo Tippy Clonal, Badamtam First Flush, Barnesbeg Tippy Clonal and Green Tea, Castleton Moonlight White Tea etc. Depending on the grade, a cup of tea costs between Rs. 30/- to Rs. 50/-. If you like, you can also buy any of these teas from the outlet. They come in packets of various sizes and rates range from Rs. 360/- per kg up to Rs. 5,400/- per kg. Puri mentioned that elsewhere in Darjeeling the same tea may be costing double as others buy it from Goodricke and resell. There are light snacks available as well. During the high season, they keep lot more varieties of snacks. In low season you will get muffins, brownies, cakes, biscuits etc. The outlet also serves coffee. There is also an Ice Cream counter on the right which is managed by a young lady. So although named 'House of Tea', this outlet essentially operates more like a cafe. 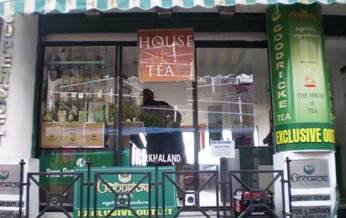 The tea lounge and Goodricke's tea outlet House of Tea is located on Nehru Road that leads to the Chowrasta Mall. If you get into Nehru Road from Gandhi Road and start walking towards the Mall, the outlet is right after the Bata Shoe Shop on the left.